The prolonged wet season of 1882 was the catalyst for the Kuranda Scenic Railway. The residents of Heberton were close to starvation after the roads became unpassable and they began to agitate for a railway. In March 1884 the route was chosen and in May 1886 work began. Construction was difficult in challenging terrain and much of the work was done by hand. At the height of construction over 1500 men (because it was the 1800’s!) worked on the line and 32 workers lost their lives before the Kuranda Scenic Railway was finally opened for passengers in June 1891. Read the full story here. 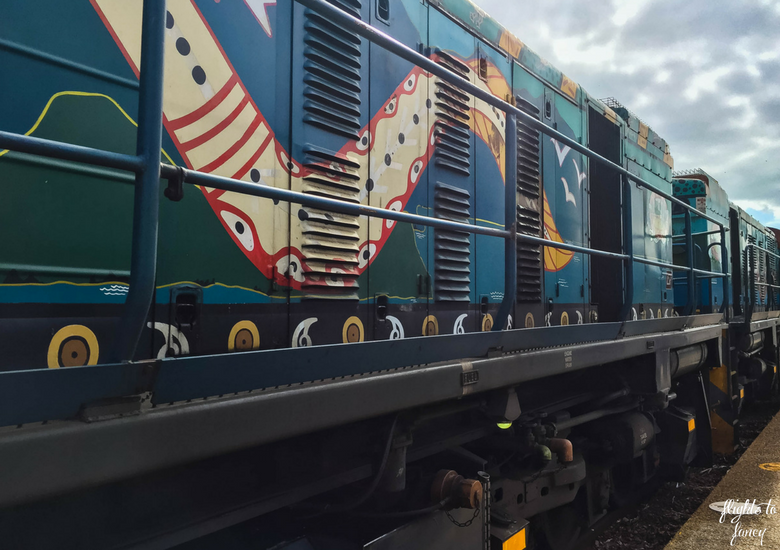 The Kuranda Scenic Railway is now pulled by a locomotive and in recognition of the Djabugay people of Tropical North Queensland the engine is adorned by Buda-dji, the carpet snake who according to legend carved out the Barron River. 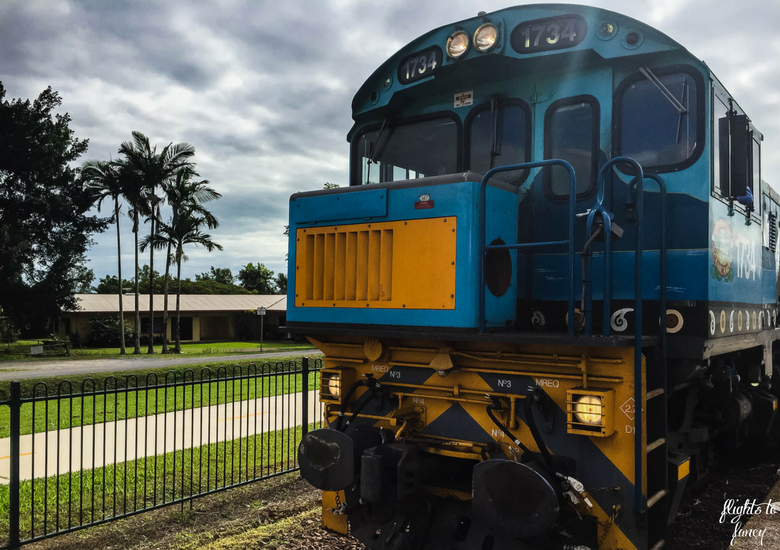 There are two trains per day from Cairns to Kuranda and we took the early train from Freshwater station after driving our bargain hire car the short distance from The Abbott Boutique Hotel where we stayed. You can also join the train from Cairns station if you wish. The 34 klm journey is undertaken at a leisurely pace and takes 1h 45m in total. During your time on board you will be lifted to 328m above sea level, travel through 15 handmade tunnels and cross 37 bridges in some of the most spectacular terrain of The Wet Tropics World Heritage Area. 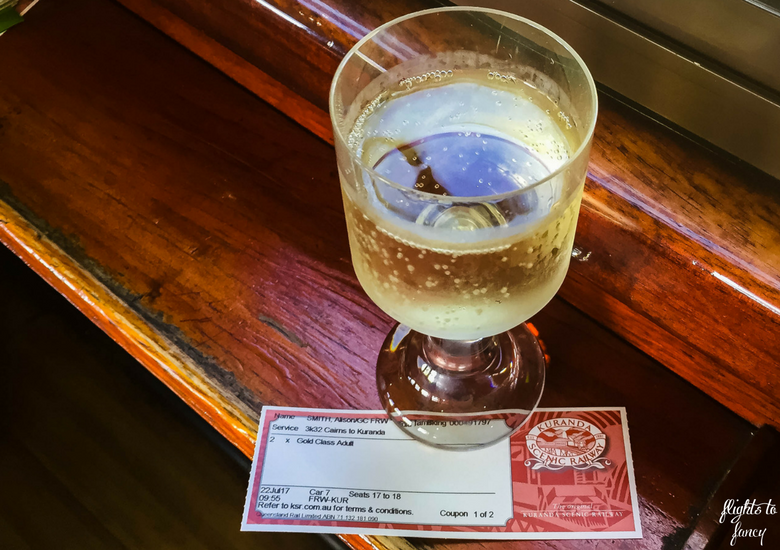 You know I am all about luxury for less and for only $50 more than the cost of a regular ticket you can upgrade to the Kuranda Scenic Railway Gold Class experience. 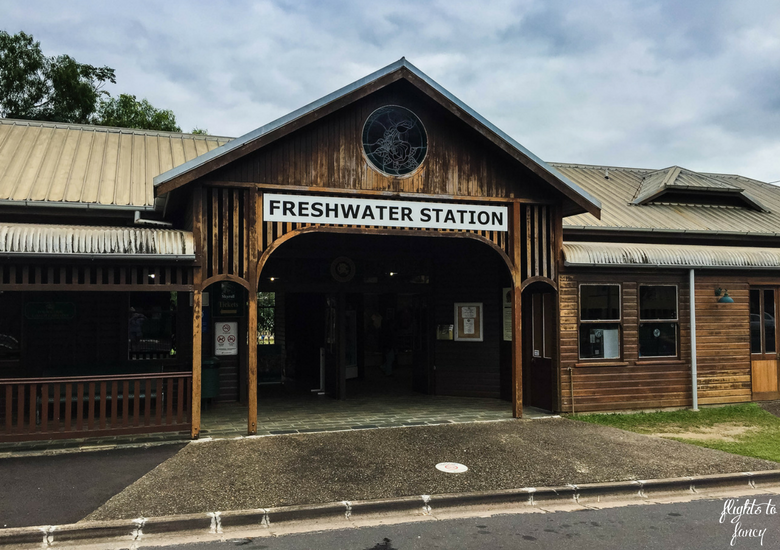 The rock star treatment starts as soon as you check in at Freshwater Station where you are escorted to a Gold Class exclusive waiting area and presented with a refreshing pre-trip mocktail. There are a number of Gold Class cars and we were seated in car 7. Make sure you check your ticket to see which of the comfy lounge chairs you are assigned. Our host greeted us promptly and wasted no time serving my first champagne of the day. The Hubs opted for a beer instead. A delicious morning tea (and more champagne and beer!) followed as the train chugged onwards. The cars are intimate and you will only be sharing the space with a handful of others. Of course a fully functioning restroom is provided. We loved the gold class experience and I highly recommend spending the little bit extra. 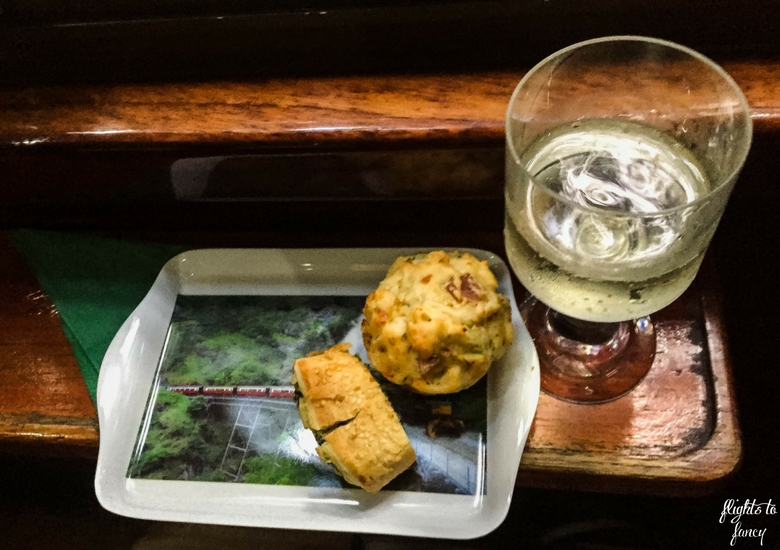 At the end of the journey all guests of Kuranda Scenic Railway Gold Class are presented with a parting gift. 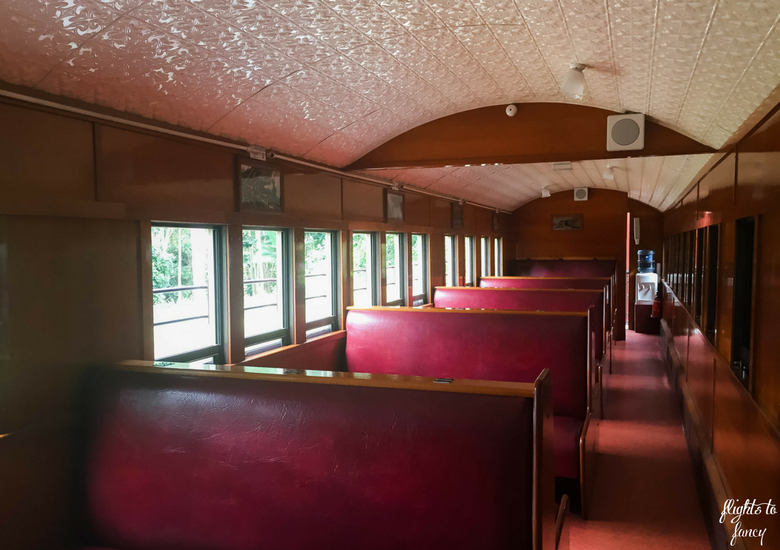 The whole time we were onboard the Kuranda Scenic Railway my eyes were glued to the sash windows. An ever changing vista passed us by and the staff very helpfully made announcements when the best photo opportunities were approaching. My favourite was Stony Creek Falls. The train passes so close you could almost reach out and touch them. Barron Falls is one of the big draw cards and the train stops for about 10 minutes to let passengers get a better view. While you can take photos from the platform, I suggest walking the short distance to the lookout for an even better vantage point. 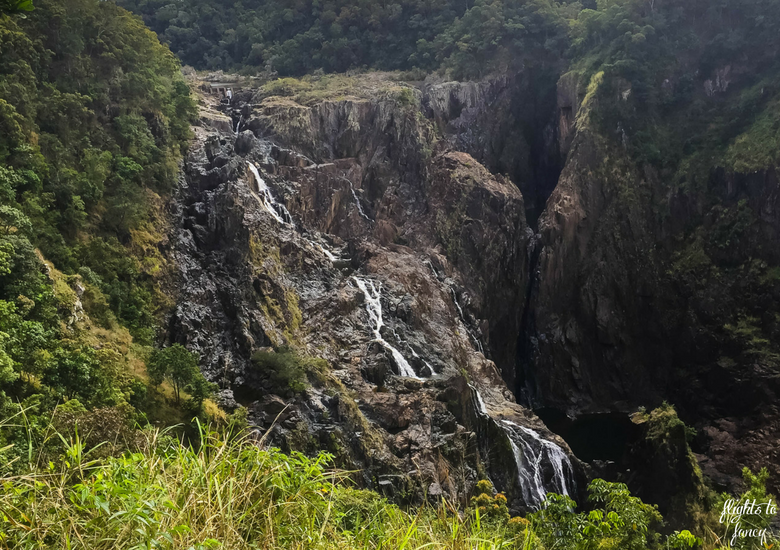 Kuranda is a quaint little town that is well worth spending a few hours in before you head back to Cairns. Visit the markets, browse the local shops or grab a bite to eat. 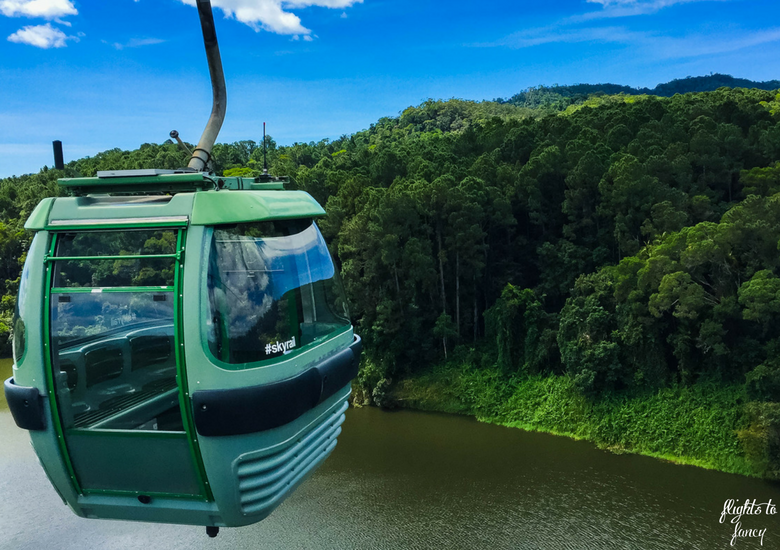 Many visitors choose to make the return journey on the Skyrail Rainforest Cableway Cairns for a completely different view of the magnificent rainforest. Packages are available that combine the two. 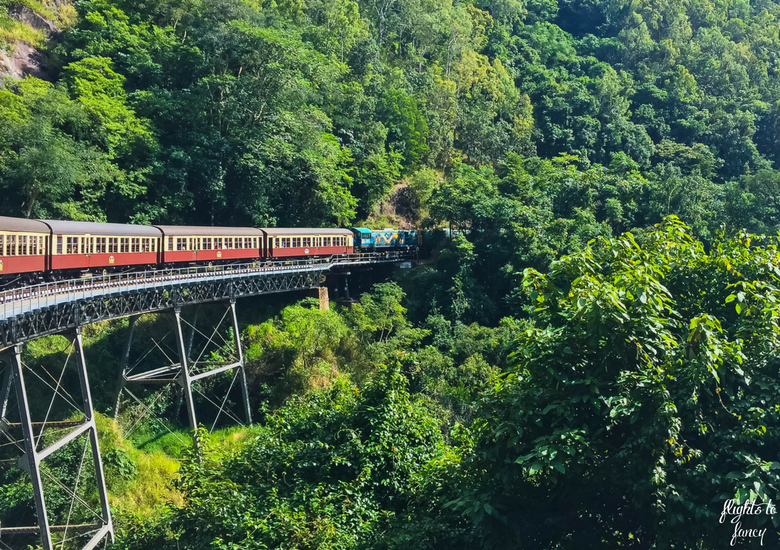 The Kuranda Scenic Railway is one of the most unique things to do in Cairns and is very popular so savvy travellers book their tickets ahead online. We had a fabulous day out and we were sorry to see our journey come to an end. 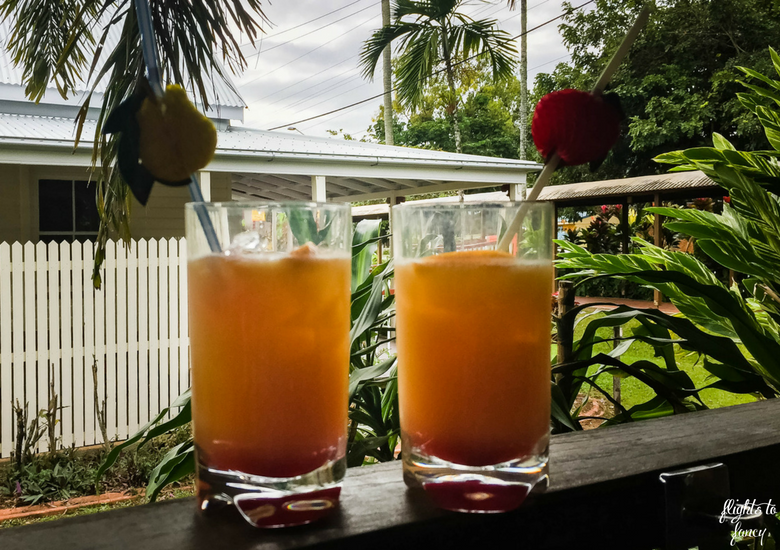 If you find yourself in Cairns this is one experience you don’t want to miss! 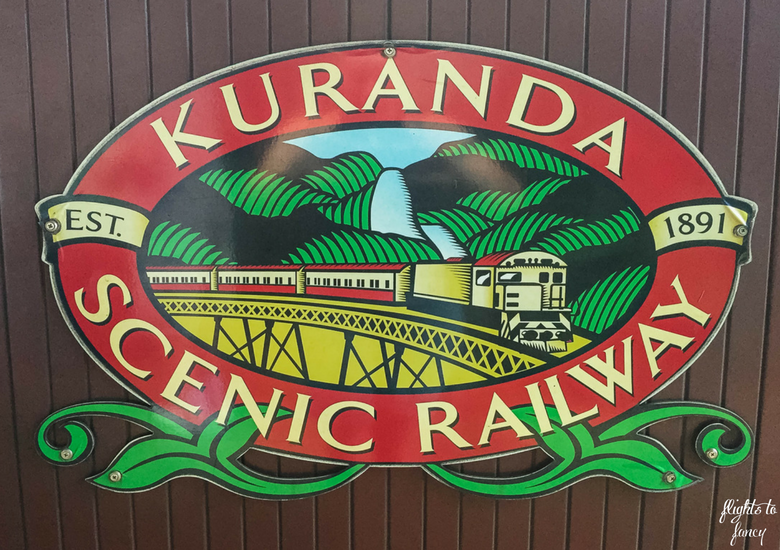 Have you been on the Kuranda Scenic Railway? I’d love to hear your thoughts in the comments below. 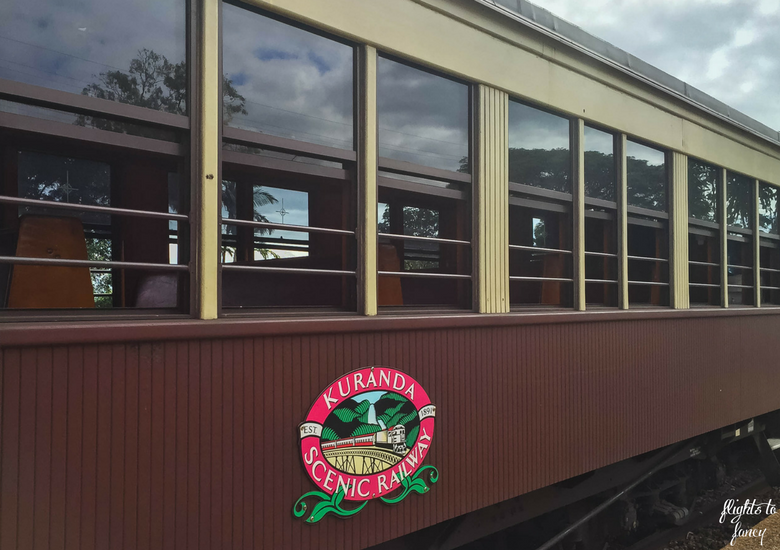 Disclaimer: We travelled as guests on The Kuranda Scenic Railway. As always, all opinions are my own. This post contains some affiliate links which will earn me a few cents to contribute to the running of this site if you make a qualifying purchase at no extra cost to you. This has long been on my bucket list! The problem is getting the hubster to want to come too. He grew up in North Qld so this is all old familiar territory to him. I however have never been to Cairns and am determined to get there one of these days!!! Beautiful! 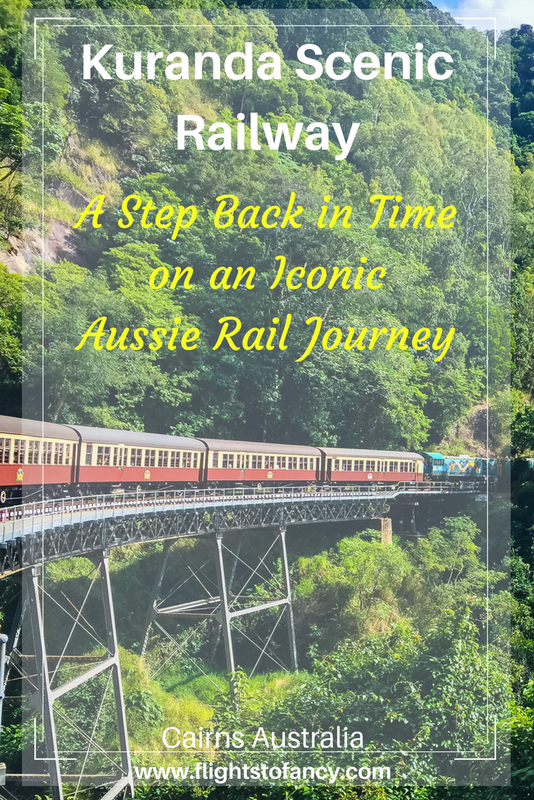 Never heard about it before but I loved this scenic railway journey and loved the history behind. 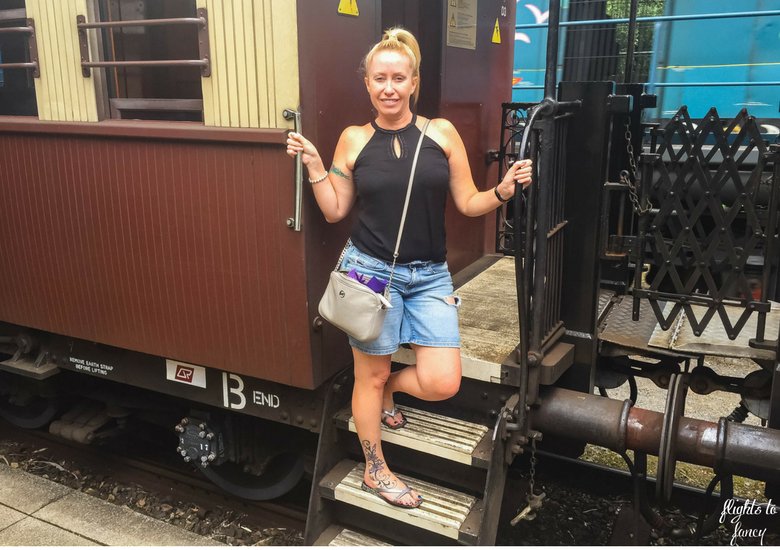 I have not been to Cairns (yet) but when I find my way to it I will be sure to do the kuranda scenic railway, the landscapes are amazing! This is so beautiful! I hope to visit Australia in the next years. It will be my first time. This definitely looks like something I’d be up to do! That’s awesome Linda! Australia is such a diverse country, it truly has something for everyone! I hope you love it as much as I do! Wow, nice looking, very ancient, Kuranda railway will definitely attract a lot of tourists. It may be possible to book a week or even a month in advance to travel on the train and take the train. Yes you can definitely book ahead to make sure you get the dates you need. We booked around a month in advance but I’m sure you could leave it a bit later. ? Wow! How I wish I could experience something like this. It must have been wonderful riding a historic train with this scenic and beautiful view. The interior design of the train is likewise amazing especially that it’s vintage. 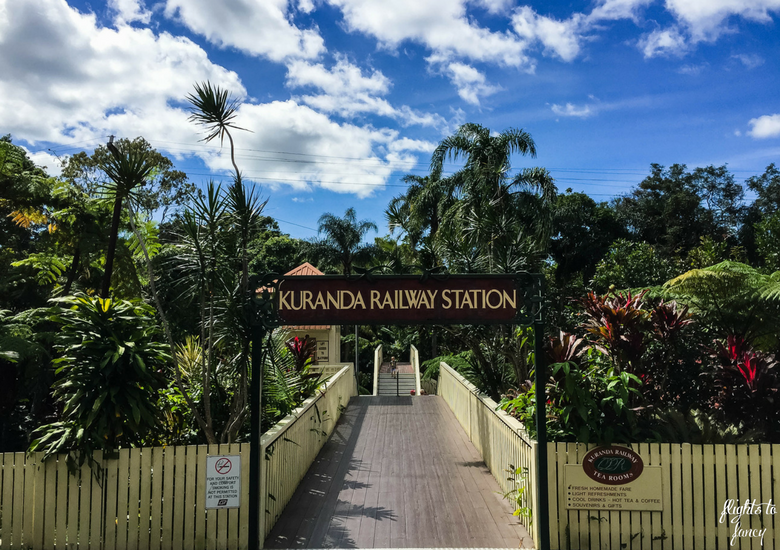 The Kuranda Scenic Railway is definitely a must to visit. It sure was lovely. 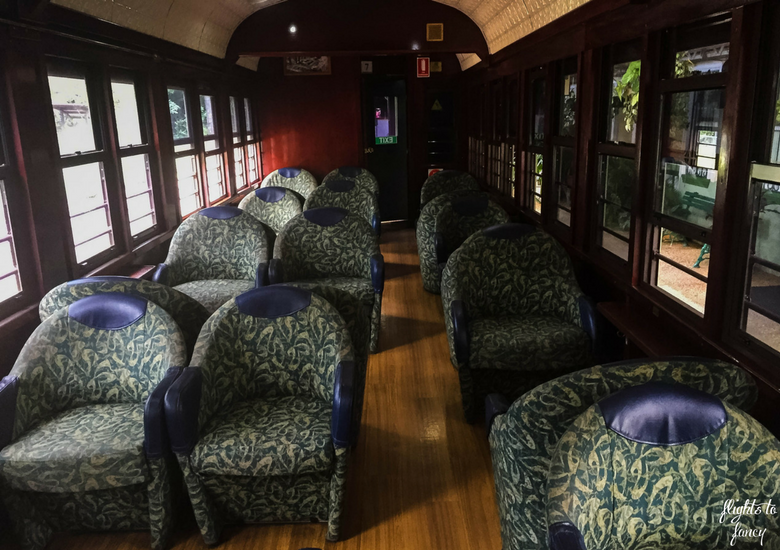 I hope you get a chance to ride the Kuranda Scenic Railway soon ? The Kuranda Scenic Railway looks like a must see tourist attraction when visiting Cairns. Good tip on booking tickets ahead of time to avoid disappointment. I like the vintage look of the train and getting the chance to take a ride through history. Historic trains are definitely more fun to ride than your everyday commuter trains. The skyrail looks like a fantastic way to finish off the trip. Both are a must! We had a fantastic day ? Incredible views! No wonder why you couldn’t get your eyes away from the window. For that difference in price, the luxury experience sounds definitely worth it! I highly recommend the Gold Class Alberto. 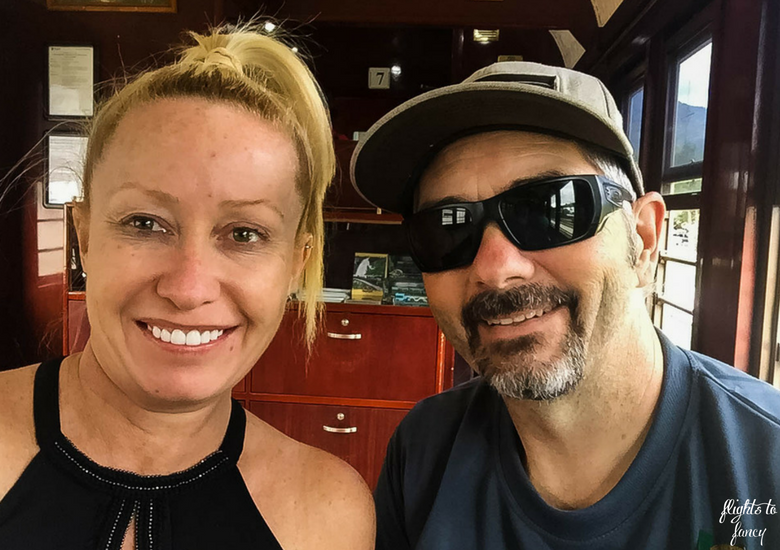 KSR is a must do in Cairns. 50 dollars more to just upgrade to the gold class? That’s a small price to pay for a luxury experience! The chairs look so comfy. BTW, the views are stunning on your train ride! Totally agree Cat! Well worth the extra! At the risk of sounding completely stupid, I didn’t even know the were train connections in Australia! For some reason I thought it was just all connected by bus routes. D’oh! This route looks incredible, though, and I can’t believe it’s only $50 more than a regular ticket!!! Definitely too good an offer to pass up. Those views are just incredible, Australia really is a stunning country, I can’t wait to visit some day! Hahaha Rhiannon we do have trains and this is one of the best! Yep. Totally get what you mean about the difference in train travel here. I LOVE the idea of a railway trip like this. I keep looking at loads of destinations and this one hadn’t propped up. I’ll definitely be doing it when I visit Aus. The railway seems very nice and enjoyable. We took many trains while in Europe and had many great views. The views you had seem to rival the views we had. However, your accommodations were much nicer than any rail car we were on. Sometimes it is worth to splurge a little. Absolutely worth the splurge in this instance! So glad we did Gold Class! Oh so much luxury! I love it. What a great way to see a different side of Cairns! I thought my daily commute on the vline was luxurious! No champagne. Yet. I love traveling by train too! Esp certain heritage trains and mountain railways are just such an enjoyable thing to do! Gold class experience with champagne and those plush chairs? Sign me up!!! Indeed so scenic with those waterfalls and greenery. Returning by cable car and seeing it all from atop would be perfect! This combined both of this Bhusha! I’ve been to Cairns a few times. I can’t believe I didn’t do this earlier! 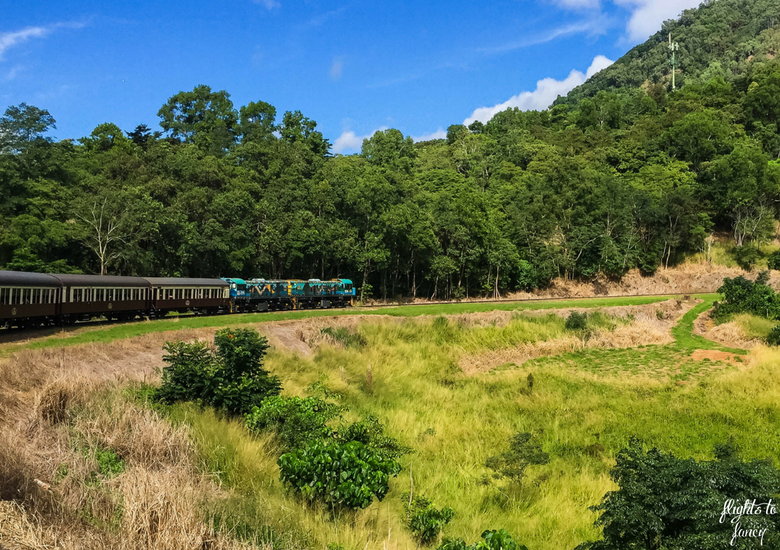 As I always rail scenic routes, this Kuranda Scenic Railway route looks so perfect for me. Passing through lovely woods that too in classy Gold Class must be so memorable journey. Stony creek falls are stunning and so photogenic. Loved your post. It was really lovely Yukti. Not the fastest train I have ever been on but certainly one of the best! I love train travel too, so the Kurunda Railway is one for me. The compartments look so cosy, and upgrading sounds like a good idea. Those views are wonderful, and makes you want to see it for yourself. Upgrading was the best idea Lisa. The service was amazing! The train looks beautifully antique and gorgeous and the gold class cabins seems a delight. Although I’m a budget traveler but the luxury of gold class at as low as 50$ looks a worthy upgrade. I’ve not been to Australia yet, but will surely include Cairns in my itinerary once I’m there. Thanks for sharing. They have maintained the heritage features so well Shibani. Love that this is a little slice of Aussie history that has been retained. What a fun adventure! I love traveling by train and you’re right: it’s not the same as the daily grind getting to work. I think it’s so cool that they announce when you’re coming upon a photo op. And the fact that they stop so you can get a better shot? That’s just awesome! This is nothing like my daily commute lol! They slow right down even when they don’t stop Rachelle! It’s all about the views ? That is a scenic route. That train ride is going to take me back in time. Love those cute coaches and the views the ride has to offer. The views were amazing Gokul. We went to Cairns many many years back, and they did not have this Scenic Railway at the time. We went by bus one way and came back by cablecar. What a lovely scenic route it must have been, and train is so perfect to enjoy that. Must go again and experience this. Yes you must go again Punita. I’m sure Cairns has changed a lot since your last visit. Oh yes this train ride is a must do when you’re in Cairns. I have been on it twice, but would love to do it in style in Gold Class. 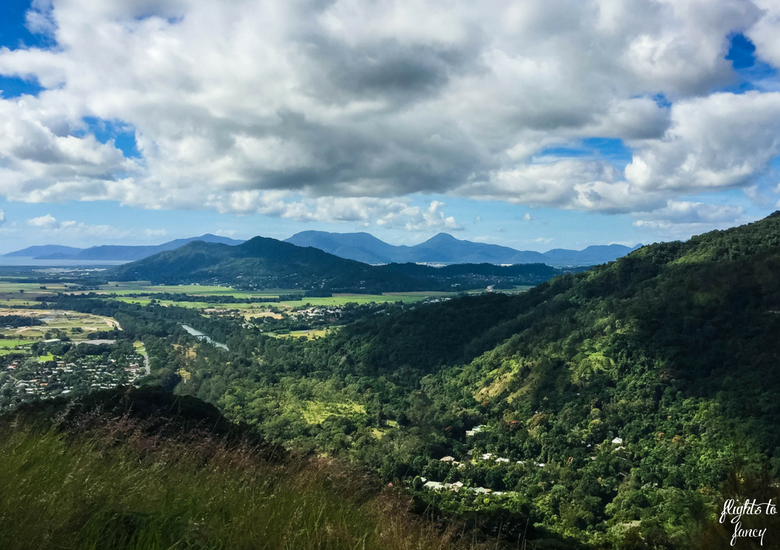 The views are amazing from the Cairns Hinterland. Lucky you Kathy! So glad you enjoyed it. You must do Gold Class next time! What a fun train journey! 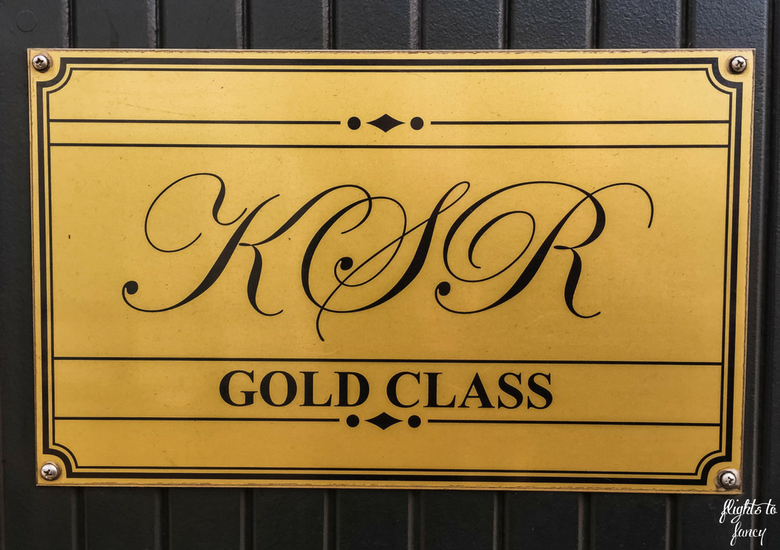 Like you, I’d definitely upgrade to the gold class experience – what a steal. 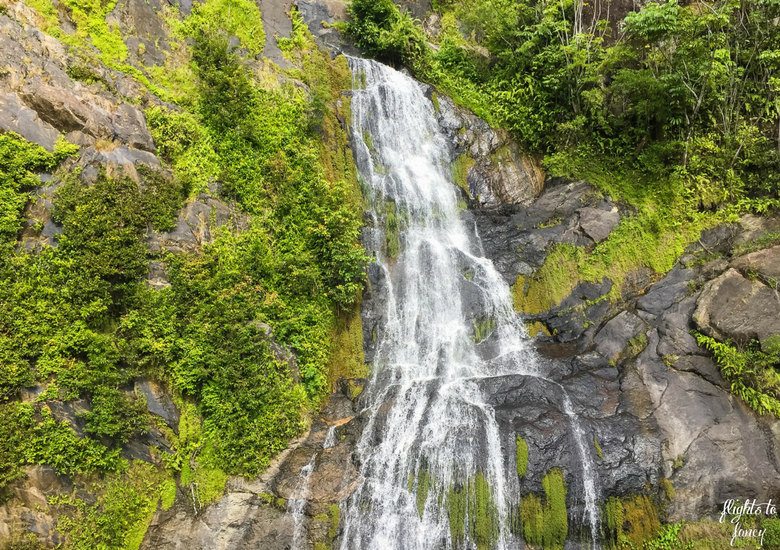 The stony creek falls look absolutely incredible. I have yet to make it to Cairns but will definitely stop in Kuranda for a few hours when I do! I actually preferred Stony Creek Falls to Barron Falls simply as they were just so close.